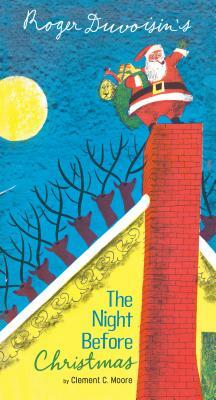 A Christmas treasure from beloved Caldecott-winning illustrator Roger Duvoisin. With glorious illustrations by Caldecott-winning illustrator Roger Duvoisin accompanying Clement C. Moore's classic text, this edition of "The Night Before Christmas" makes the perfect stocking stuffer and is just the right size to make a wonderful gift. Families enjoy reading Moore's famous poem year after year at Christmastime, and this edition adds something unique and beautiful to the traditional experience. Roger Duvoisin was born in Geneva, Switzerland, and came to the United States in the 1920s. He wrote and illustrated 40 books, including those about Petunia the silly goose and Veronica the hippopotamus, and illustrated over 100 more by other authors. He received the Caldecott Medal in 1948 for White Snow, Bright Snow and a Caldecott Honor in 1966 for Hide and Seek Fog, both written by Alvin Tresselt. Roger Duvoisin died in 1980. Clement C. Moore (1779–1863) was a professor of literature and theology, and the author of the famous poem "A Visit from St. Nicholas," which later became known as the famous "'Twas the Night Before Christmas." The poem was first published anonymously but later was attributed to Moore. Moore's text greatly contributed to the modern-day Santa Claus story.